Piazzale Michelangelo in Florence is an outdoor terrace on the south, or left bank of the River Arno. It was built in the late 1800s to allow visitors and residents of Florence to admire breathtaking views of the city from a high, park-like vantage point. It was named after Florence's favorite son, legendary artist Michelangelo Buonarotti, and is adorned with bronze copies of some of his most famous sculptures, Today, it is a must-see stop on any visit to Florence, and a panoramic photo of the Florentine skyline taken from Piazzale Michelangelo is essential. Many visitors get there, take a few photos and then turn around and walk back to Florence's centro. But since you're already in the neighborhood, there are several worthwhile things to see and do on this side of the river. Here are some top things to see and do around Piazzale Michelangelo, including the piazza itself. If you're walking from central Florence, cross the Arno at Ponte Vecchio and bear left on Via de' Bardi, which will start to gain elevation as it veers away from the riverbank and becomes Via di San Niccolò. Bear right again on Via di San Miniato, then continue until you reach the rose garden and see the Scalinata del Monte alle Croci stairs on your left–climb these to the piazzale. If you prefer to skip the uphill climb, you can take city bus 12 or 13 from the Santa Maria Novella train station or other points in centro. A taxi ride from centro to the piazzale should cost no more than €10. 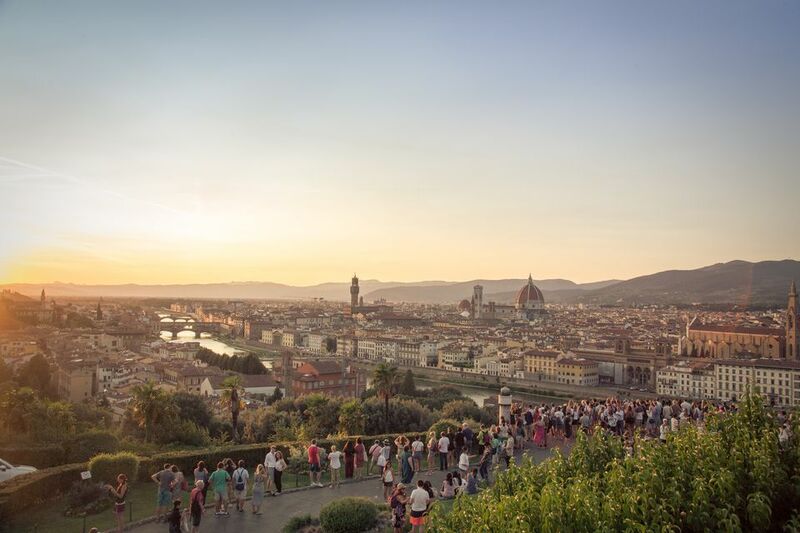 Many people like to bus or taxi up to Piazzale Michelangelo, then enjoy the scenic, downhill walk back to central Florence. The views from this broad, open space are the finest in Florence and maybe anywhere in Italy, especially as the sun sets. The piazzale is typically crowded with tour bus passengers and tourists who've made their way up on foot. But no matter how you get there or how crowded it is, it's worth it for the stupendous views. You'll see a lot of street vendors—legal and otherwise—keen to sell you souvenirs and fake designer handbags. (Do watch your own handbag, camera or wallet in this busy place.) If you want to linger without the crowds, dine at La Loggia, a rather pricey cafe and restaurant offering the same great views in a more refined setting. About a 10-minute walk uphill (with stairs) from Piazzale Michelangelo, this beautiful 11th-century abbey and church complex is worth every ounce of effort to get here. Its geometric facade of green and white marble and gold mosaics is visible from the center of Florence, and its interior is a jewel box of early Medieval religious art and architecture. Resident monks still produce candles, sweets and herbal products, which make unique gifts and at 5:30 p.m. most days, they celebrate mass with Gregorian chant. Carefully tended grounds and a cemetery with some elaborate tombs make this a pleasant, atmospheric place to spend an hour or so. These two free, public gardens on either side of Piazzale Michelangelo are perfect for flower-lovers or anyone who wants to wander in a peaceful green space, free from the nearby crowds. You'll walk past the rose garden (Giardino delle Rose) if you're coming from central Florence, and it's open daily during daylight hours. The iris garden, just east of the piazzale, is only open from late April to late May, when the iris are in bloom. It's about a 25-minute walk, mostly level or downhill to the Pitti Palace, the vast museum complex that's part of the Uffizi Gallery. The 15th-century, Brunelleschi-designed palace houses room after room of Renaissance to modern works of art, plus galleries devoted to costume and noble household items, as well as rooms of private apartments once home to the Medicis and Hapsburgs. The adjacent Boboli Gardens are a study in Renaissance perfection and have interesting botanical specimens. If you're making a day of it on Florence's left bank, you may as well make a night of it too, and head to the Santo Spirito area in Oltrarno, a district favored by Florentine residents and tourists trying to get a feel of a local Florence neighborhood. The Brunelleschi-designed Basilica di Santo Spirito has a modest exterior but a fanciful Baroque-style interior, as well as a cloister, and a wooden crucifix carved by Michelangelo. Piazza Santo Spirito is something of a living room for the neighborhood. By day there's a produce market and by night, the piazza buzzes with crowds, music and impromptu dancing outside its many bars and restaurants. What Are the Most Important Piazzas in Florence, Italy?